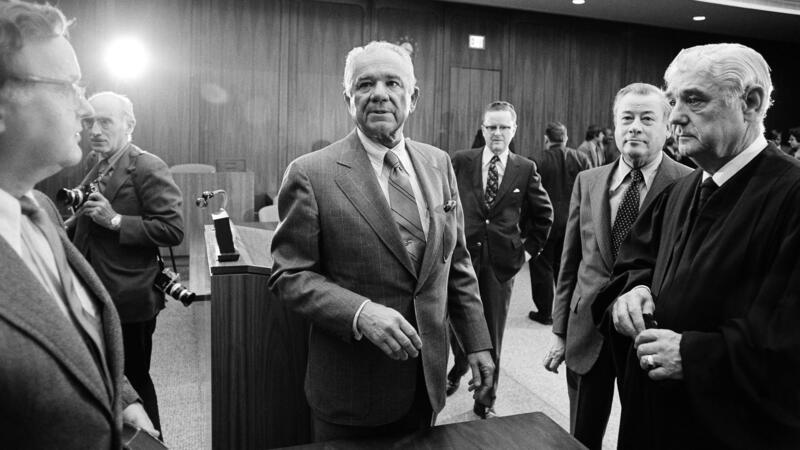 Watergate special prosecutor Leon Jaworski at his swearing-in on Nov. 5, 1973. A long-sealed "road map" prepared by Jaworski's office has now become public. Last week, one of the last remaining secrets from the Watergate scandal was finally revealed. It's a report that prosecutors sent to Congress 44 years ago, but experts said the document could offer a precedent for how the Russia investigation moves forward now. By early 1974, Watergate special prosecutor Leon Jaworski concluded he would not pursue an indictment against President Richard Nixon. Instead, he shared the grand jury's findings with the House Judiciary Committee. "It gave them the sum total of the evidence that we had assembled up to that point," Jaworski recalled in an interview a few years later. "We called it a road map in our office because it was just that." Jaworski's office compiled much more evidence about the Nixon administration's transgressions in Watergate than congressional staffers could have working on their own. The Justice Department concluded that the president could not be indicted while in office. If Nixon were to be held accountable, that required impeachment, which must begin in Congress — in the House Judiciary Committee — and Jaworski's office set down a plan for how, legally, to transmit their work to members of Congress, plus the work itself. Those findings arrived in a sealed report, marked with the date: March 1, 1974. "For 44 years, the road map lived only in the public imagination and today it lives in the public record," said Deana El-Mallawany, counsel at the nonprofit group Protect Democracy. Protect Democracy helped convince Chief Judge Beryl Howell of the U.S. District Court in Washington, D.C., to finally lift the seal on the road map and shed light on an episode that demonstrates how the system worked. "It's been really exciting to learn about this example in history where you actually do have the three branches of government working together to ensure that no one's above the law, not even the president, and that the facts become public," El-Mallawany said. But it's not just a matter for history. One of the arguments for releasing the Watergate road map bears on the current investigation of whether President Trump's campaign conspired with the Russian attack on the 2016 election. "The president's lawyers are telling everyone who will listen that [Justice Department special counsel] Bob Mueller is writing a report," said Benjamin Wittes, a senior fellow at the Brookings Institution and one of the scholars who pushed for the release of the Watergate road map. "And that raises the question of what kind of report that could be, what it could look like, who the audience for it is." There aren't many precedents for how a report might look. One is from the independent counsel Ken Starr, who investigated President Bill Clinton 20 years ago. The Starr report contained lurid descriptions of Clinton's affair with White House intern Monica Lewinsky. It appeared in newspapers and as a bestselling book but became the focus of a lot of criticism. By contrast, the Watergate road map is a series of bare-bones statements, backed up by grand jury testimony or documents to support its points. "It contains no judgement, no argumentation. Very spare recitation of facts," Wittes said. And he added, that sounds familiar. The current special counsel, Mueller, hasn't made any public statements since he was named to investigate possible links between Russia and the Trump 2016 campaign. He's letting his work speak for him, mostly in court papers. If Mueller decides to write a report, one that would go to the deputy attorney general, and perhaps eventually to Congress, the Watergate model is one he might follow. "The road map sets a precedent for the facts of special counsel Mueller's investigation becoming public through Congress and serving as the basis for whatever accountability is necessary," El-Mallawany said. It's not clear where the Russia special counsel investigation is headed next, but that's a secret that probably won't take 44 more years to reveal. This past week, one of the last remaining secrets from the Watergate scandal was finally revealed. It's a report that prosecutors sent to Congress 44 years ago. Experts say the document could offer a precedent for how the Russia investigation moves forward today. NPR national justice correspondent Carrie Johnson reports. CARRIE JOHNSON, BYLINE: By early 1974, Watergate special prosecutor Leon Jaworski concluded he would not pursue an indictment against President Richard Nixon. LEON JAWORSKI: For good reasons and reasons that I thought were proper, I did not think that he should be indicted the same time that the others were. JOHNSON: Instead, he shared the grand jury's findings with the House judiciary committee. JAWORSKI: I gave them the sum total of the evidence that we had assembled up to that point. We called it a road map in our office because it was just that. JOHNSON: Those findings arrived in a sealed report dated March 1, 1974. DEANA EL-MALLAWANY: For 44 years, the road map lived only in the public imagination. And today, it lives in the public record. JOHNSON: That's Deana El-Mallawany. She's a lawyer at the nonprofit group Protect Democracy. Protect Democracy helped convince the chief judge of the district court in Washington to finally lift the seal on the road map and shed light on an episode that demonstrates how the system worked. EL-MALLAWANY: It's been really exciting to learn about this example in history where you actually do have the three branches of government working together to ensure that no one's above the law, not even the president, and that the facts become public. JOHNSON: But it's not just a matter for history. One of the arguments for releasing the Watergate road map bears on the current investigation of President Trump's campaign. Benjamin Wittes is a senior fellow at the Brookings Institution. He's one of the people who was pushing to release the old documents. BENJAMIN WITTES: The president's lawyers are telling everyone who will listen that Bob Mueller is writing a report. And that raises the question of what kind of report that could be, what it could look like, who the audience for it is. JOHNSON: There aren't many precedents for how that report might look. One is from independent counsel Ken Starr, who investigated President Bill Clinton 20 years ago. The Starr report contained lurid descriptions of Clinton's affair with White House intern Monica Lewinsky. And it became the focus of a lot of criticism. By contrast, the Watergate road map is a series of bare-bones statements, backed up by grand jury testimony or documents to support its points - again, Ben Wittes. WITTES: It contains no judgments, no argumentation, very spare recitation of facts. JOHNSON: Wittes says that sounds familiar. The current special counsel, Robert Mueller, hasn't made any public statements since he was named to investigate possible links between Russia and the Trump campaign. He's letting his work speak for him. And if Mueller decides to write a report, one that would go to the deputy attorney general and, eventually, to Congress, the Watergate model is one he might follow - Deana El-Mallawany of Protect Democracy. EL-MALLAWANY: The road map sets a precedent for the facts of special counsel Mueller's investigation becoming public through Congress and serving as the basis for whatever accountability is necessary. JOHNSON: It's not clear where the Russia special counsel is headed next. But that's a secret that won't take 44 years to reveal. Carrie Johnson, NPR News, Washington. Transcript provided by NPR, Copyright NPR.